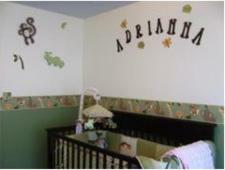 A baby room border is an easy, effective and inexpensive way to add drama to your nursery design. You can use a baby room border as a coordinating item to pull your nursery decor together or you can use it to deliberately split your walls creating a point of interest and contrast. 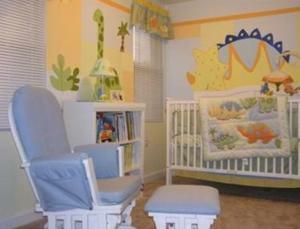 There are many different types of baby nursery borders. 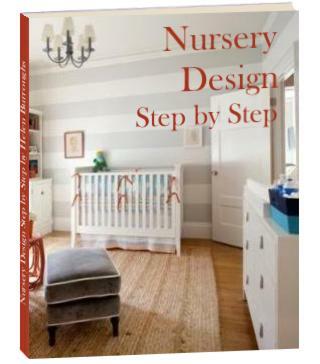 Choose from wallpaper, chair rails, hand painted, stripes, stencils and more depending on your nursery style and your creativity. 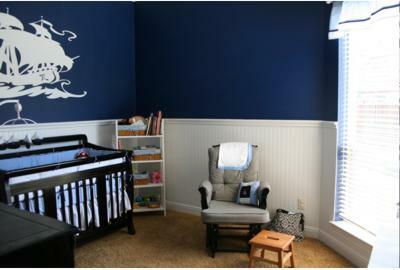 Nursery wall borders can be placed near the center of the wall or close to the top or both. You can paint the top and bottom of the walls different colors or use different paint effects, for example, stripes at the bottom and polka dots at the top. The possibilities are endless - take a look at some of the nursery ideas in our gallery to get some baby nursery decorating ideas of your own. 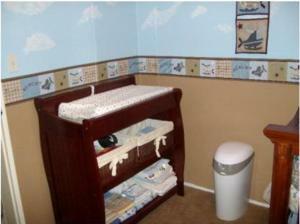 Wall paper nursery wall borders are a quick and easy option for the less adventurous. 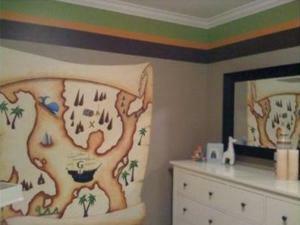 They are available to match many bedding sets and are great way to tie your baby nursery together. Dividing your baby room wall and only painting the top half with a mural can save you a lot of time and effort and is particularly effective in a smaller nursery room where most of the bottom half of the wall will be behind furniture anyway. In this vintage baby nursery the two chair rails have been mounted close to the ceiling and have had beautiful vintage alphabet cards spaced out evenly between them. 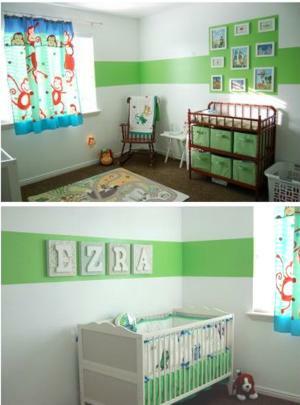 This modern nursery has a very effective, and easy to paint, bright green border about two thirds of the way up the wall. Bold and dramatic! It has been cleverly painted to showcase these beautiful wall letters and photos. 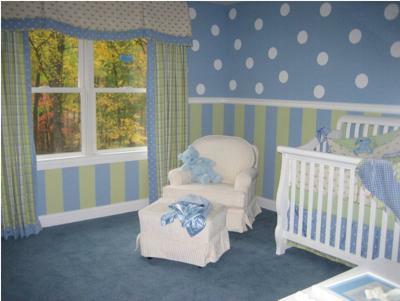 Taking it a step further, this colorful baby room has a border of several different colors, one above the other. Another great idea is to stencil a pattern or picture inside your stripe. This one has been extended into wall letter circles. Finally, if you are feeling inspired, this is a wonderful example of how to incorporate a small mural in your baby room border stripe. Simple, but wonderfully effective. 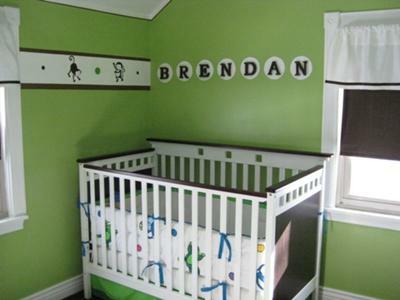 A stenciled baby room border can be as simple or as elaborate as you want it to be. You can use one color or many and stencil in a straight line or a pattern. It's up to you. Tip: Trace your stencil onto paper a few times and cut out the paper shapes. Place them using double sided sticky tape until you find a pattern you like. Now you are ready to paint!